The Sumatran Elephant is the smallest subspecies, but the largest mammal existing on the island of Sumatra. They can weigh up to 5tonnes and reach 9ft in height! With a stranger appearance to their African cousins, the Sumatran Elephant is almost completely bald with small rounded ears. Female Sumatran Elephants rarely have tusks, but the females that do keep them hidden away from sight until they open their mouths! These creatures love to roam the luscious lowland forests of Sumatra, sometimes venturing uphill to mid-altitudes so long as it is below 300m! The island of Sumatra is located within Indonesia, and contains a wide range of animal and plant species. Unfortunately many of these species have become endangered as a result of tropical forest loss. Currently, there are only 2,400-2,800 Sumatran Elephants left. As herbivores, these noble animals spend their days munching on 150kg of plants as seeds as they move through the forests. That’s the weight of two entire male humans in plants… every day! Just like other elephants, Sumatran Elephants are sociable animals and need large areas of land with enough food and shelter for populations to flourish. Females travel and gather in groups, looking after one another whilst the males live solitarily. Check out our Elephant family page for more facts on Elephant behaviour. Habitat loss is the main cause of population decline, with 69% of potential Sumatran Elephant habitat lost between 1980 and 2005. 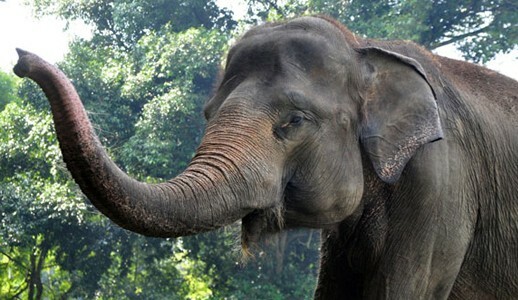 In a similar time frame, Sumatra also lost 50% of it’s Elephants as a result. Increasing human populations and need for land are the main drivers of tropical forest loss, and you can find out more about this conservation crisis here. Poaching is also a problem in Sumatra, most notably from agriculturists who own or are setting up palm oil plantations. This illegal act of killing occurs through poisoning, electrocution and trap methods. Although Sumatran Elephants are categorised as critically endangered on the IUCN Red List, this act continues, and organisations have called on the Sumatran Agriculture Ministry to tighten restrictions. If you want to be an Elephant ethical tourist, read our latest blog!